Dementia has been in the news in a big way over the past week. Tuesday the 11th of December saw the first ever G8 Dementia Summit opening in London, with a headline grabbing promise from David Cameron to double funding for dementia research by 2025. This follows similar promises of urgent action on dementia put forward last year in the Prime Minister’s Challenge on Dementia, which in fact promises (rather more generously) to ‘[m]ore than double […] overall funding for dementia research to over 66m by 2015’. Dementia, its treatment, prevention, and (one day, we might hope) ‘cure’, has shot up the national agenda over the last few years. In the process, a discourse has developed around the topic which—as is so often the case with discussions of culture in the public sphere—has drawn upon largely economic measures of value. A language of costs, budgets, investments and returns has shaped the media headlines over the past week, matching the immensity of the social ‘problem’ of dementia with talk of eye-wateringly (and eye-catchingly) huge sums of money. As part of the Cultural Value Project, our research has a stake in these discourses. From July onwards we have been working on an initiative entitled ‘Bloomsbury Festival in a Box: engaging socially isolated people with dementia’. On a basic level, this project aims to take a peripatetic version of the Bloomsbury Festival—a community focussed arts festival in the heart of London—out to local residents unable to leave their homes and engage with it directly. Specifically, we have been working closely with Age UK Camden’s Dementia Befriending Service, and with the Faculty of Brain Sciences at University College London, to develop and analyse a cultural outreach for those living with dementia. The idea here is to offer a chance for such people to engage not just in the reception, but in the collaborative creation of cultural experience. Working with Age UK Camden, and with a pool of Bloomsbury Festival artists, we have initiated a programme of weekly visits that take a number of specially designed Festival Boxes out to people’s homes. Each weekly visit comprises a short cultural activity designed to prompt reminiscence—singing, painting, ceramics work, a poetry recital or writing workshop—followed by a short narrative interview reflecting on the experience. Visits are audio-recorded, and a quantitative single-question happiness measure is also taken at the beginning and close of each session. All artists and researchers also keep research journals reflecting on their experience. Over the course of the project, each of these Festival Boxes has developed into a unique cultural experience. They have become a personalised ‘archive of engagement’ for each participant, and this has allowed us to respond sensitively to the participants’ needs, and to focus on what Tom Kitwood (1997) has famously described as ‘the personhood of people with dementia’. The Festival in a Box project has therefore developed opportunities for reminiscence and narrative storytelling, but also offered an opportunity for analysing the core value of cultural experience itself. By working with participants who, as a result of their memory loss, tend to experience cultural engagement ‘in the moment’, within a disordered narrative present, we have been able to gather valuable material on the affective experience of culture amongst a traditionally ‘hard to reach’ population. The project is now moving towards its concluding stages, in which the transcribed data gathered from our visits will be analysed via a series of close textual readings across our research team. As well as offering valuable research data, this project will also provide an opportunity for reflecting upon the ‘value’ of socially isolated people within a ‘cultural’ context. It will provide a means through which—we hope—to reintegrate the stories of those living with dementia into the broader narrative of the Bloomsbury Festival, of Camden, and of London itself. In Harmony-Sistema England (hereafter IHSE) is a social and music education programme whose approach and philosophy derives from the activities of the National System of Youth and Children’s Orchestras and Choirs of Venezuela. The ‘El Sistema’ programme, developed in the 1970s, emphasizes intensive ensemble participation, group learning, peer teaching, and a commitment to musical learning and music making. It has seen considerable success in Venezuela where numerous youth orchestras have been created in deprived areas to help combat the social problems that blight them. In 2009 three pilot IHSE projects, based around this El Sistema model, were developed in England. 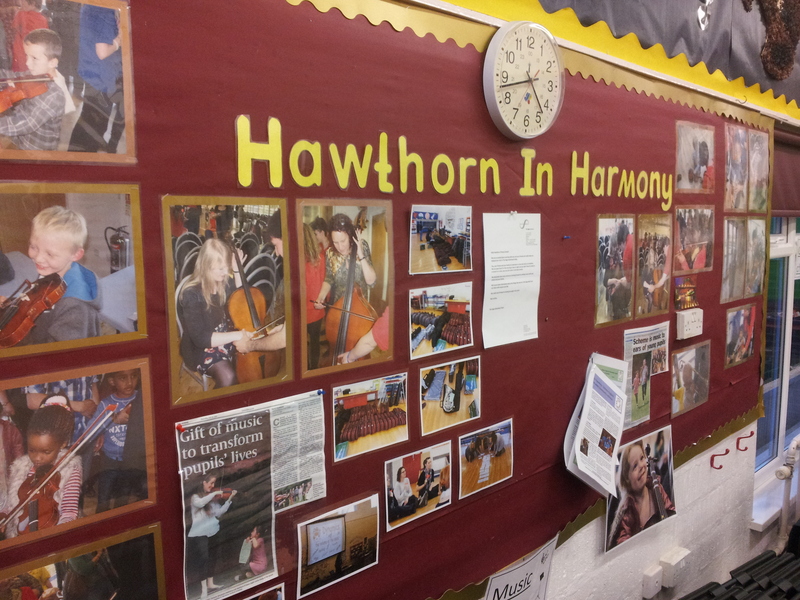 Following the publication of the National Plan for Music Education in 2011, the programme was extended and today there exist a total of seven IHSE projects operating across England. What makes this initiative so interesting to us as researchers – in terms of questions of cultural value – is that while most child-focussed music initiatives in Britain have attempted to link music to forms of social good by employing popular music forms (see, for instance, the ongoing work of Youth Music), IHSE adopts an orchestral model and predominantly uses classical and folk music forms. As a result, the initiative makes for a rich site of engagement with questions of cultural value and their relationship to the broader benefits of music-based participatory arts. In particular, by exploring the ways children and their wider communities understand cultural value in relation to their IHSE projects, our research hopes to not only contribute to recent debates urging the need to transcend the ‘instrumental’ vs ‘intrinsic’ impasse (seen as hindering understandings of the value of the arts), but also, by exploring three different case studies, offer insights into how values relate to the different dimensions of arts activities and experiences. While there does exist a growing set of data relating to IHSE initiatives, to date there has been scant engagement with our primary focus: the ways in which the cultural value, in IHSE projects, is understood and articulated by the young project participants themselves. Undoubtedly, in this we have set ourselves a number of unenviable methodological and practical research challenges. If only eliciting talk – relevant to matters of cultural value – from primary-aged children (some as young as 5) were as simple a process as putting a Dictaphone down on the table and starting a conversation! Thankfully, many of the issues bound up with conducting research with children have been covered in numerous volumes, and Tisdall et al (2009) summarise some of the debates – which have informed our methodological reasoning – quite usefully. One issue which emerges quite clearly from such work concerns the importance of facilitating the expression of voice on the part of children and the role of adult researchers in relation to this. Prominent as this issue is however, there is little universal agreement about quite how such matters are to be best negotiated, with some scholars noting the desirability of the ‘least adult role’, some disputing whether that is ever realistically possible and others suggesting that it might be more helpful to be an ‘unusual adult’, free from traditional adult/child binaries. One outcome of our methodological preparations has therefore been to alert us to the need for flexibility and adaptability in our researcher roles as we attempt to vacillate seamlessly between the roles of professional, trustworthy and decidedly ‘adult’ university researchers (when liaising with school staff and other adult stakeholders) while striving for approachability, empathy and (perhaps most challengingly!) a degree of cultural savviness when conversing with our cohorts of young musicians. There can be little doubt here that working directly with head teachers and IHSE tutors to help us determine the most appropriate research methods and activities to support our conversations with children has been invaluable. Thankfully then, our chosen methods do appear to be yielding fruit, as our young research participants have spoken – through the course of a series of ‘games’ based around the ranking and ordering of a range of social, cultural and specifically musical activities – to the varied ways in which they figure aspects of cultural value. By adopting this playful approach to the generation of ideas for discussion, we have begun to uncover portraits of not only the range of cultural activities they value and the diversity of ways in which they value them but also insights into how IHSE activity fits into this overall picture. Our project’s data collection phase will continue until February 2014 and we look forward to deepening and systematising our findings over the coming few months.